Amber Alert Neighbors and Businesses in the Exact location your pet was last seen. 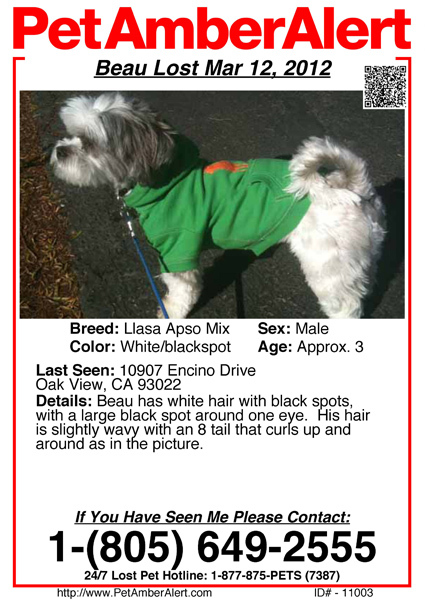 When you combine our phone and poster alert systems it produces the best possible results in any lost pet situation. Our system can notify the whole street or the whole town and the chances your pet will run into someone who has received a PetAmberAlert™ about your pet are over 78%. Fax and Phone Alert your Missing Pet’s Information to Businesses/Neighbors. Alert Animal Shelters and Neighbors at the Same Time to Maximize your Results. Our Database is Updated Daily for Accuracy and the Best Possible Amber Alert Results. Pet Detectives Will Personally Review Every Lost Pet Case for the Best Possible Results. Save Money vs. Other Search Methods. Save Time by Alerting Thousands of People in Minutes. Detailed Alert Area Map/Address Log Provided. Hundreds of Pet Loving People Will be Looking Out for Your Missing Pet. We Phone Alert every house in the neighborhood your pet was last seen. Local Neighbors in the area receive a personalized recorded message about your pet immediately. When someone finds a lost pet, they will take it home while they decided what to do. However when they get home they will receive a lost pet message with your contact information. Phone your Lost Pet Voice Recording Right to Local Neighbors/Residents. Alert the Neighborhood Before your Pet Roams Farther Away from Home. Most Accurate/Largest Database of Residential Phone Numbers in the USA/Canada. Pet Detectives will Review your Local Area Map and Target Areas Where Pets Roam. Avoid Door-Door Knocking & Phone Expenses. Save Time by Calling Hundreds of Neighbors in Minutes. Hundreds of Local Neighbors Will Hear About your Pet and will be on the Look Out! Local Pet Businesses in the area receive your poster immediately. When someone finds a lost pet they will take it to a local Vet, Animal Shelter, Rescue Group, Animal Hospital, or Pet Store. However they will already have a pet amber alert poster with your contact information available. Fax your Lost Pet Poster Right to Local Veterinarians/Animal Shelters. Alert Animal Shelter’s before the 5 day Euthanasia/Adoption Hold Expires. Most Accurate/Largest Database of Pet Related Businesses in the USA/Canada. Pet Detectives will Design a Poster that Attracts Attention and Produces Real Results. Avoid Poster Printing & Postage Expenses. Save Time by Distributing Hundreds of Printed Posters in Minutes. Poster Delivery Confirmation Same Day. Hundreds of Local Pet Businesses Will See your Poster and will be on the Look Out! Plus, when your pet is found, the finder can access our up-to-date database to contact you. Local Pet Businesses and Agencies Will Receive Your Alert! How do you find lost pets so quickly? Why do you alert neighbors and businesses? It is extremely important to cover every angle. When someone finds your lost pet they will keep it at home or drop it off at the local shelter, vet’s office or pound. However with our system all bases are covered to make sure that your lost pet is safely recovered and does not slip through the cracks! Why do you have such a high success rate? Do shelters/vets/hospitals register to receive alerts? No, as long as they exist, they will receive the alert. Our process is like no other in the industry. In fact, we do something no other company does – we make more than 5 million phone calls each year to verify that all contact information is current and updated. What if my neighbor is not home during the alert? Do you call random people in my zip code? No! Unlike other services, our alerts are targeted directly to the exact street address. Expect local neighbors door to door and street to street to receive the amber alert call. What phone number will show on the caller id? The phone alert calls will show your main phone number on the caller id for all calls. You will receive call backs/sightings directly to your phone. We also provide the option to use our toll free phone number on the caller id, we will handle all incoming calls and forward the legitimate calls to you! Do I need to provide my neighbors phone numbers? No, we provide everything once you complete the sign-up form. Our Pet Detectives design the poster, record the alert message and will even provide helpful tips specific to your pet’s situation. My pet has been found, how do I cancel my alert? Please login to the Pet Recovery Members Area and mark your pet as found. You may also call 1-877-875-7387 EXT 2. Why is it important that I cancel my alert? It is important to make certain to inform all places you contacted (including us!) and remove flyers. Otherwise, valuable time is wasted which could be used for pets that are still missing. What if I live in an apartment complex or condo? Not a problem! Our extensive database of phone numbers includes apartment complexes and condos. What if I lost my pet on vacation? Our system can issue an amber alert to any location in the United States. Simply enter the street address your pet was last seen and we send the alert to this location. What if my neighbors phone is unlisted? PetAmberAlert is a national DNC excempt organization, we are allowed by law to amber alert your neighbors even if they are on the DNC, unlisted, or blocked. What if my neighbor does not have a landline? Not to worry! Our system will call the number that is registered with the credit bureau/utility company. This includes cell phones, mobile devices and voip phone systems. Do you provide any reports or status on the case? Yes! We provide extensive documentation with every alert. You will receive an alert coverage map and a full detailed report (including name, address, phone, time of contact, etc…) of every neighbor/business contacted by us for your verification. What hours do you call neighbors? Due to FTC regulations and common courtesy, phone alerts are only processed from 9am to 9pm in your time zone. How long is the phone alert message? Each phone alert message includes 60 seconds of description/details. We include all pet details, and repeat the contact information twice in each call!